Sabrina Ionescu drives for two of her 26 points on the night. Photo courtesy of Oregon Athletics. Eugene – No. 8 Oregon used a strong second half run and red hot shooting to dominate No. 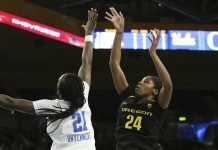 18 Arizona State Sunday and run away with a 74-64 win. The Ducks shot 66 percent en route to becoming the lone undefeated team in Pac-12 play, at 6-0. Sabrina Ionescu led four in double figures with 26 points, while Ruthy Hebard added 20 points on 9-9 shooting. Maite Cazorla scored 15 points and Satou Sabally, 10. The hosts got out to an early lead that the Sun Devils erased, and Oregon took a 38-34 advantage into halftime. The Ducks opened the third quarter with a 16-0 run, as Arizona State missed their first seven shots, finally scoring on a Kianna Ibis three-point play at the 1:32 mark. A Cazorla three-point shot with 7:20 remaining gave Oregon their largest lead, 68-41. Coach Kelly Graves inserted reserve players, and the lead dwindled as time expired. Though their shooting was off the charts, Graves was especially pleased with his team’s defensive effort. 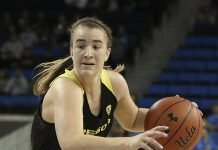 Ionescu said the Ducks need to play tough defense for 40 minutes. Ibis led three Sun Devils in double figures with 22 points. It was their first loss to Oregon in four meetings. The Ducks, who shot a season-low 38 percent against Arizona Friday, is now 17-2 overall. 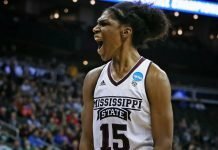 Their two losses have come at the hands of undefeated Mississippi State and unbeaten Louisville. 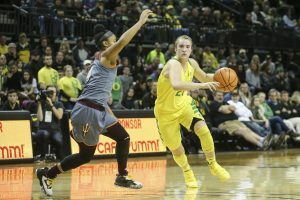 Ionescu said, however, that her team is still a work in progress. Next up for Oregon is the “Civil War” against Oregon State. Friday they travel to Corvallis to play, and Sunday they host the No. 22 Beavers in what promises to be a bruising series. Graves celebrated his birthday Sunday. As the game’s final seconds ticked, many in the raucous crowd of 4,516 sang “Happy Birthday” to him.